Coronary artery disease is one of the most common causes of death. Treatment of coronary artery disease and its sequelae is costly and may pose an unnecessary risk to the patient if performed needlessly. Imaging of myocardial viability became well established for optimizing indication an resource allocation in patients suffering from myocardial infarction. While myocardial viability imaging is routinely performed using 18Fluorodeoxyglucose-positron emission tomography, single photon emission computed tomography or magnetic resonance imaging, multislice-spiral computed tomography (MSCT) techniques emerged as new tool for visualization of myocardial infarction. 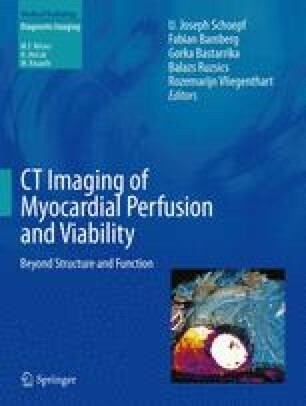 This chapter describes different concepts of MSCT viability imaging such as unenhanced CT for assessing calcifications and fatty infiltrations. The focus will be direct visualization of nonviable myocardium by depiction of delayed myocardial contrast enhancement. The clinical relevance of the different MSCT techniques is described. Basic concepts on how to perform late phase MSCT are introduced.